Self-service markets are the healthy, new, exciting way to vend. Imagine your office break room transformed from an uninspiring environment filled with processed high sugar and salt foods to an eye pleasing boutique-like micro market where fresh, interesting, fun foods are available to you and your staff, at any time of the day or night. And if your break room consists of a dirty microwave, a leaking coffee maker and a fridge packed with leftovers some of which can no longer even be identified as food then a Monumental Markets self-service market is something you should really consider. And the best part? It is FREE to you, the employer. A Monumental Markets self-service market is a no-cost solution to on site healthy vending. There are so many benefits to installing our self-service markets in your workplace from a wellness perspective, to an efficiency standpoint, to a morale booster. Studies show that employees today are seeking healthy snack and meal alternatives. Gone are the days when a candy bar and a diet soda are the snacks of choice. 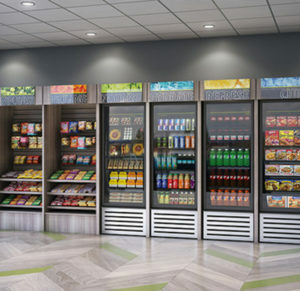 With a Monumental Markets self-service market your employees will have access to fresh salads and sandwiches, healthy beverages, and veggie snack trays among many other nutritious and tasty options. Studies further show that productivity, efficiency and focus are improved when employees eat healthful foods. So installing one of our self-service markets not only benefits the employee but you as well. Another great aspect of a Monumental Markets self-service market is that it does not require an attendant. Our markets are unattended automated markets with technology so advanced that theft and maintaining stock is not an issue. Related to this is the ease of use of our beautifully designed open door markets. A Monumental Markets self-service market displays your customized selections (yes, you get to pick exactly what you want) in various ways—baskets, bins, cases and shelving. Your employees and visitors can check out nutritional information prior to purchasing, compare items, and then decide what to purchase. He or she will then simply scan the item and pay for it using a Monumental Market card, a major credit card, or should you choose this as an option—an employee id. Our innovative designs means that we can make your custom market as small or as large as you like—you will not have to give up a lot of precious square footage to have a full and exciting on-site self-service market for your business. As you can see, we are very proud of and eager to share the Monumental Markets self-service market concept with businesses across the District of Columbia, Maryland and Virginia. Please give us a call and let us show you how we can help increase your staff’s productivity and improve office morale and wellness—we know you will share our enthusiasm once you see firsthand what a Monumental Markets self-service market can do for your business.